There are so many things our body does for us each day that we take for granted: breathing in and out without thinking, heart beating along unnoticed, words coming out of our mouths with barely a thought. You only start to notice when things begin to break down. Unfortunately for me, this happened about 10,000 feet into climbing Mount Fuji. I’m young and in reasonably good shape. I have strong legs and lungs from biking 12 miles a day in New York. Though I had no mountain climbing experience, I’ve done plenty of day hikes in California. Information on the internet suggested that spry octogenerians made the trek every year – why couldn’t I? Already in the clouds at the fifth station at the Kawaguchiko trail, where most buses drop you off. If you forgot anything, buy it here, as things get more expensive up the mountain! There’s also an ATM here. We ascended first thing in the morning after arriving from Tokyo, planning on descending by nightfall, doing it all in one day – as many do successfully. The first three hours were child’s play. 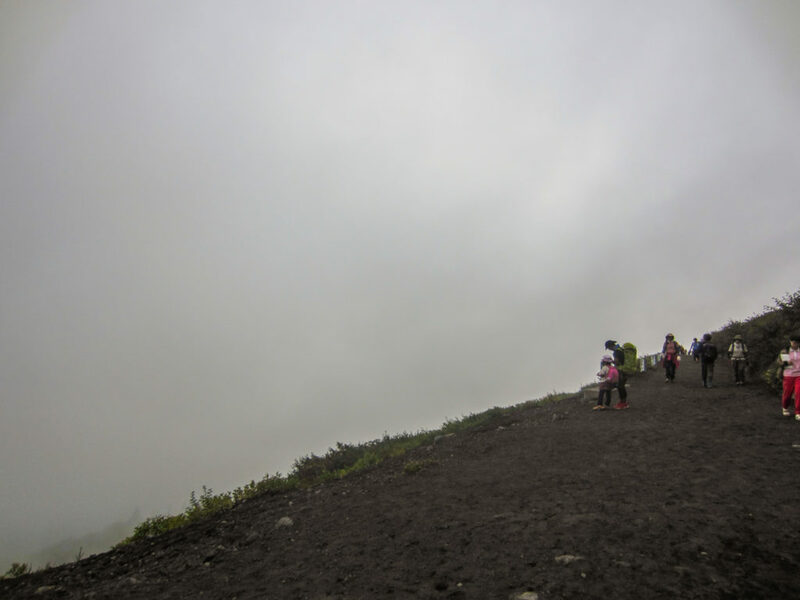 We took the Yoshida trail, which started at the Fifth Station at Kawaguchiko, about 7,500 feet above sea level. I noticed I got out of breath slightly quicker than usual and took short breaks to compensate, but I felt pretty good. At first, you walk up a dirt path, in mist so thick I assume it must be a cloud. Later, the winding path gives way to a rocky trail that gets steeper as you go. Once we broke above the clouds, it was a magical feeling. We took in the beauty at the 7th station, feeling on top of the world. I was out of breath and my ears were starting to ring a little bit, but I felt good enough to keep pressing on. A short break taking in the views energized me, and we continued up the path. Despite the looming altitude sickness, it was an amazing feeling as we broke above the clouds. But between the 7th and 8th stations, around 9,000 feet up, I started to feel differently. Altitude sickness hit me like a truck at high speed. My ears had a heartbeat of their own, and I had a migraine so blinding that every noise – even the sound of my own huffing and puffing – was agony. I had an inexplicable rash spreading on my chest, and my face felt flushed and puffy. I couldn’t walk more than a hundred feet before stopping, gasping for air that did little to quench my lungs. I expected this maybe near the summit, but not with so far still to go. This was not even my first time being that high up – I had previously spent two weeks in Quito, which is around 10,000 feet above sea level. However, the combination of 4 hours of hiking and the rapid gain of 9,000 feet in altitude in 6-hour span took a hard toll on my body. I knew that from the 8th station, there was still about another 1,500 feet of altitude to gain up increasingly difficult terrain. But things were starting to get dangerously out of whack in my body. Going up wouldn’t salve anything but my ego. The only way was down. My travel companion was completely furious with me. I urged her to continue onwards and reach the summit herself, that I would be fine as long as I went down, but she felt uncomfortable going it alone. 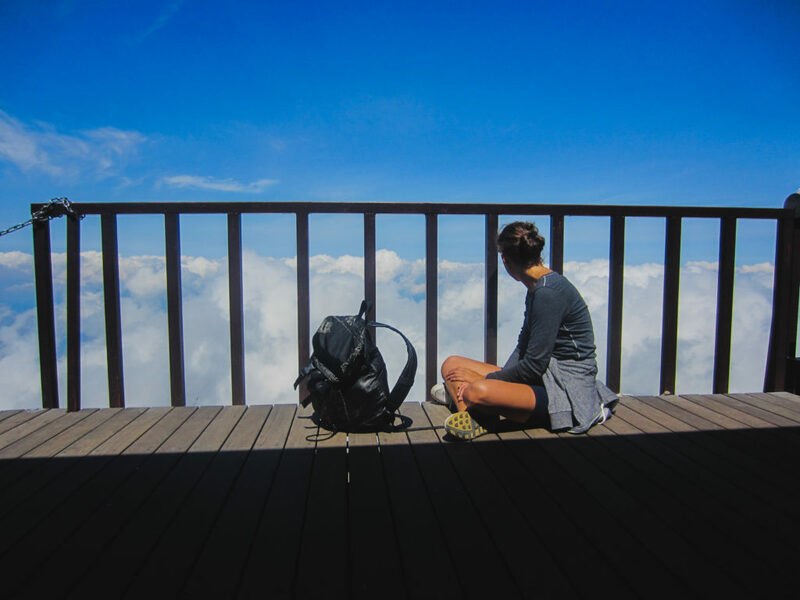 I can’t say I blame her – climbing a mountain is a taxing physical and emotional experience, and the added stress of doing it in a foreign country is surely no small feat. So down we went, which was in itself a whole new challenge, as we were colliding with traffic heading up the mountain. Still, everyone was friendly as we occasionally held up the flow of people, some looking concerned at my ashen face and wishing me well. My travel companion barely spoke to me except to mutter how dangerous it was to head down this way and how we should have kept going. I understood her frustration, but when you feel that things in your body are going seriously awry, you have to honor it and listen. The only good thing about having to go back down was to be able to actually see the amazing view I missed on the way up. It was incredibly frustrating to come so far, to come so close to summiting a mountain only to turn back. The pain I felt for the next few days – the ache in my legs, neck, and shoulders; the blinding headache that lasted three days; a nonstop ringing in my ears – felt hollow for having not achieved what I set out to do. I tried climbing Mount Fuji, but it won. I do regret not preparing more for it – but I don’t regret trying. I haven’t given up, and there are more mountains to climb in my future. Next time, I’ll be more prepared. Altitude sickness is no joke. If you start to feel seriously ill, you’re already in the throes of it and you need to take it seriously. In addition to packing the right outdoor gear, you should be aware and prepared for potential altitude sickness. Here are a few tips for preventing altitude sickness. If you don’t have at least two days to summit a mountain of this height – or three for other higher mountains – I would recommend not doing it at all. 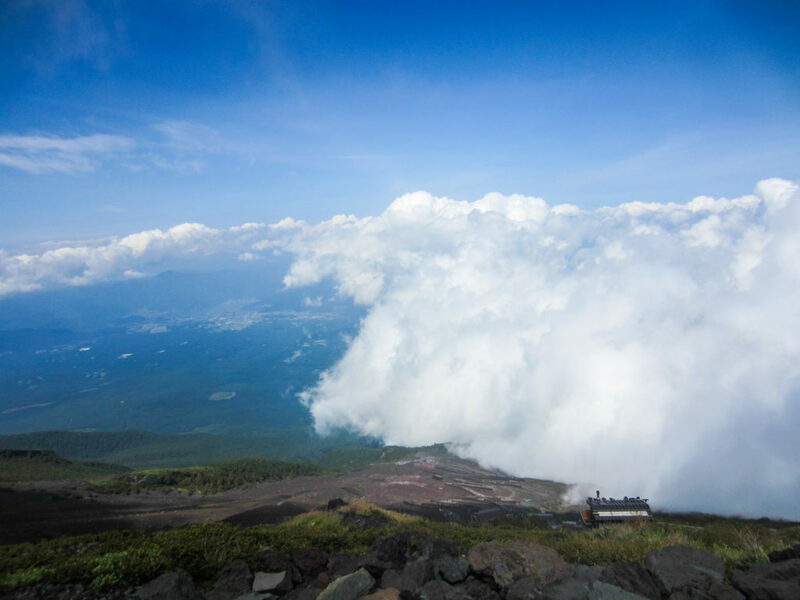 Summiting Mount Fuji in a day is possible, but it depends on your own physical stamina (which changes with altitude), weather conditions, your mindset, and timing. Leave yourself wiggle room. 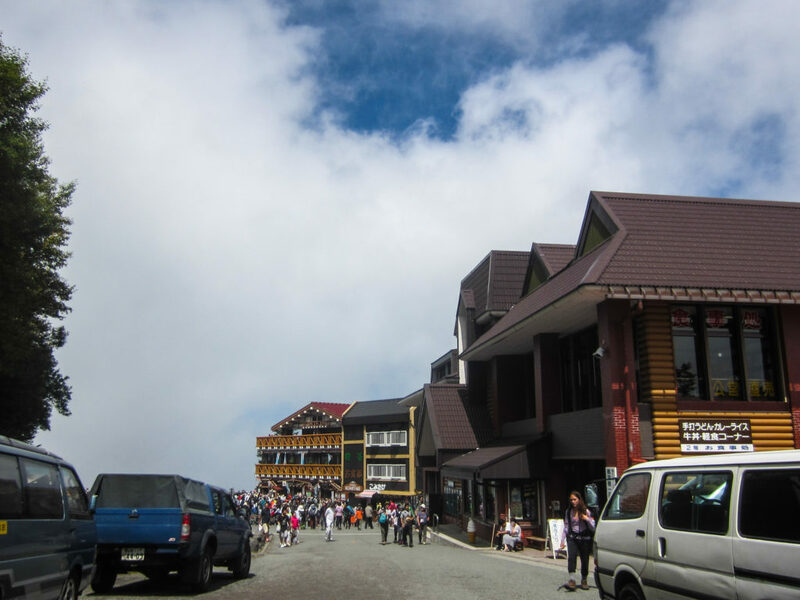 I know when you’re traveling Japan on a budget, you’re trying to save money, but if you can’t afford to spend a night on the mountain if needed, it may not be the best idea for you to go. 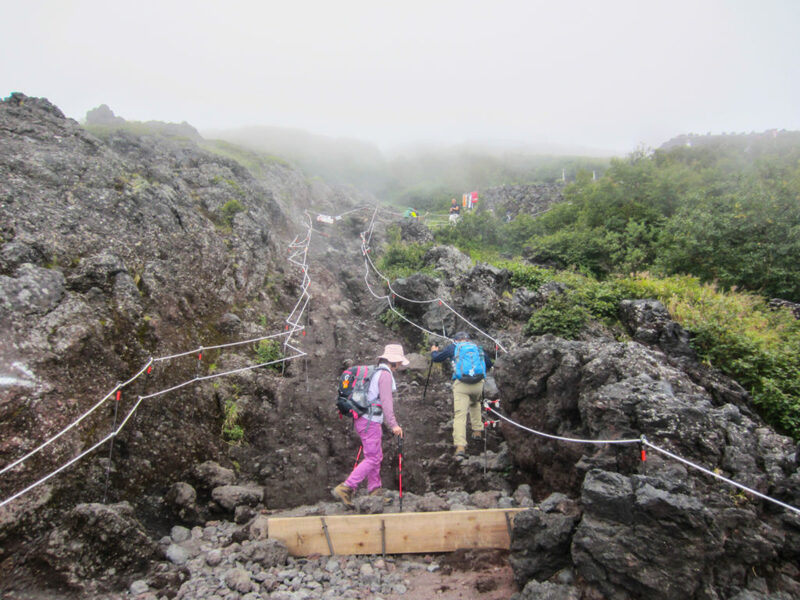 Another mistake I made was trying to climb the mountain too soon after arriving in Japan. I should have given my body more time to acclimate to the new schedule. By climbing Fuji, not only were my Circadian rhythms totally out of whack, but my oxygen levels were too, leading to total body shutdown. If you’re coming from a long way away, use these tips to surviving a long flight to minimize the impact of jet lag. The only thing that mitigates altitude sickness is going back down. You don’t necessarily have to turn back, but have a plan for staying put and resting your body without putting it through the stress of climbing. Climbing Mount Fuji would be exhausting even if it were at sea level; altitude makes it 10x harder. 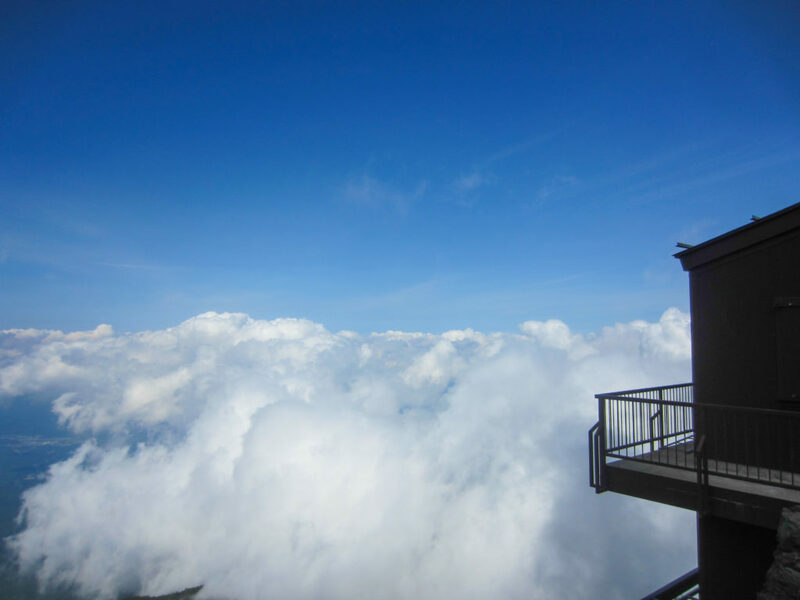 Have a Plan B – whether it’s camping overnight, staying in a mountain lodge (there are many available on Mount Fuji for $60+ USD a night), or even taking a long break. Even though I brought 4 liters of water with me, I still ended up getting severely dehydrated on my climb. I wish I had brought some oral rehydration salts, like Pedialyte, to help me replenish much-needed electrolytes and hydrate more efficiently. These are now one of my go-to packing items, perfect for everything from fighting hangovers to climbing mountains. I had never heard of Diamox until after my trip, but I wish I had! Though I can never know, I wonder if I would have been able to make it to the summit had I taken this medication. The next time I try to conquer a mountain, this will be in my bag. Doctors also recommend taking 600 mg of ibuprofen 3 times in a day (for a total of 1800 mg, but no more), starting 6 hours before you plan to ascend. OK, so travel insurance won’t prevent altitude sickness, but if something seriously wrong happens on Mount Fuji, you’re looking at being airlifted out with a helicopter. Luckily I had the presence of mind to turn around before things got serious, but if I had kept going and needed to be airlifted, I’d be living with a mountain of debt, as I stupidly didn’t have travel insurance at the time. It’s inexpensive (the one I have now costs $50 per month and covers quite a bit) and necessary, just do it, really. 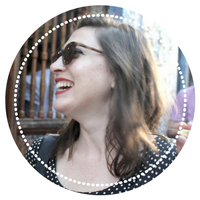 I use World Nomads now because it’s affordable and time-tested by many established travel bloggers. And who knows better than us? 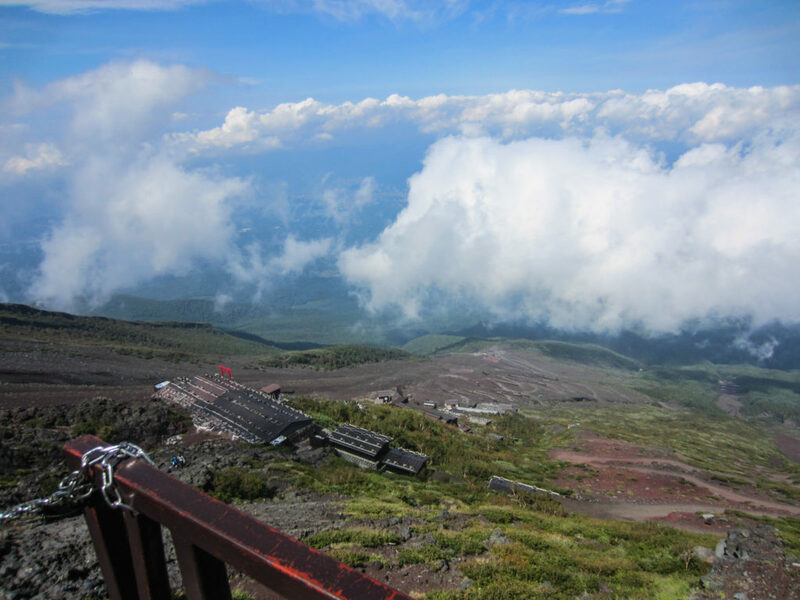 Have you climbed Mount Fuji or any other mountains? Any tips for combatting altitude sickness? Note: This post contains affiliate links. That means that if you purchase something using one of these links, I will receive a small commission at no added cost to you. No BS – I only recommend accommodations, services, and products I truly believe in. Good write-up; a shame you didn’t summit, you’re absolutely right that only you know what your body is telling you and you should listen to it – although that said, altitude sickness at 3,500m isn’t the kind of extreme condition it is on e.g. Everest, where it can cause pulmonary or cerebral edemas. You’re absolutely right about the rapid gain of altitude being the problem on Fuji – a bus straight from sea level to 2400m means it’s far too quick an ascent to get above 3000m. In my case, I felt really rough at 8th station but pushed on to the top; it was most unpleasant to be honest! But for me, the issue was that we stopped for the night in the 8th hut – it was spending those additional 7 hours at that altitude while trying and failing to sleep that allowed the sickness to set in. Had we done it as a 1-day climb straight up and down, I would’ve been descending by the time it actually started kicking in. So my advice is that a 1-day climb is actually less likely to result in altitude sickness – after all, one day or two days are both inadequate time for acclimatisating from sea level to 3,700m. 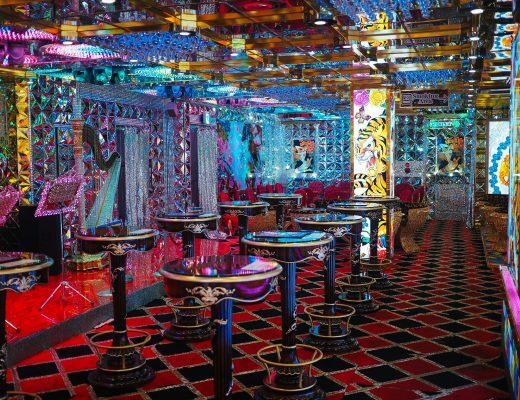 Imagine how you were feeling at 8th station, then imagine spending a night there like that! It just makes you suffer for longer! Anyway, I’ve discussed this in more detail on my own Fuji post, if you have time to give it a read please let me know what you think. Hi Simon! Thanks for taking the time to leave such a detailed comment, and congrats on summiting Fiji!! It’s a freaking tough one, that’s for sure. I learned a lot from your comment. Having never experienced altitude sickness before, it scared the crap out of me and I’m glad I turned back. Your point is a good one though, and I wouldn’t have wanted to spend a second longer at that altitude… sleeping there would have been next to impossible for me. I think it would have been good to spend a night at the 5th station before trying to climb Fuji, for me personally, and if I ever try it again I think I’ll do it that way, or at least with more climbs under my belt. It was a bit mad to take Fuji on as my first at-altitude hike! Thanks for following up! I think that would be a good plan. I’m sure it’s lovely at the top regardless of the time of day and probably a bit less crowded as well! I’m going to try to do a few mountains in between here and Fuji. I did a 2500m mountain last summmer, and that was pretty perfect for my fitness level so I’ll try to do some incremental ones in between here and there. Sorry to hear about your aborted attempt. Here is an account of our ascent which included a non-climber/hiker. When we did it in 2012 we went during the night. We caught the last bus up, which arrived at 7pm, and stayed at the 5th station for 2 hrs (while everyone else from the bus charged up the mountain straight away). After this, using self control not to run up the easy trail, we slowly walked and then waited for half an hour at each consecutive station. By the end we still needed to take baby steps, as we could feel the altitude, but easily reached the summit before sunrise. In the process we passed many of those who rushed up in the dark without adequate cold weather clothing (some so ill equipped that they needed to be wrapped in space blankets by mountain staff). After proceeding to the summit in a time of approximately 10 hrs we then descended all the way back to the 5th station in about 2 hrs. This is how such a unique mountain should be attempted if unacclimatized. That’s a really smart ascent! I admit I had no idea what I was doing, really. I found most online accounts to be a bit blasé about the difficulty of the mountain, actually, so I was supremely underprepared for everything but the cold. Noting this for future reference the next time I try a hike of this altitude! Thanks for the comment. Good to know for when I try it again. The descent on volcanoes is crazy! I’ve since climbed a few in Central America and going down always seems harder than back up. Thanks for the tips and congrats on making it to the summit! We hiked the mountain in about 6h to the top on Yoshida trail, then we waited for 3h for a sunrise, I felt ok, but I was a little bit dizzy. My friend had a moment of dizziness too. After that, I decided to make a 2,5h circle walk at the top while my friend took a nap. After spending 5h at the top I started to feel better (I didn’t sleep all night), my friend was also ok. Then we descended without any problems. I’m glad you were able to make it more successfully than I did. Congratulations!